I did the Westportif cycle on Saturday. Looking at the crowds at the start in Westport, my guess is there were around 1000 people taking part, approximately 400 each for the 160km and 80km, with 200 or so doing the 40km. Happening to be near the front at the start, I took off with a mixed group of club riders from Westport out to Louisburgh. I had no real intention beforehand of riding with a group or pushing my pace but it just fell that way and I was happy to get towed along around 28-32km/h for a while. I did have a minor “mechanical” – my Brooks saddle ~2mm too high on my borrowed BH Prisma. Should have taken it out for a longer spin before borrowing it – c’est la vie. Stopped in Louisburgh and sorted out the saddle at the small feed station – which seemed to be located just a bit early for most riders who just passed it. I got back on another group that was going by for a short while but the legs were not feeling good at all after being stretched a bit much so I decided to back it off and take it easy for a while, make sure I was ok for the whole day. Spent some time on the way down into the Doolough Pass chatting with a few folks, stopped and took a picture for a couple in front of Doo Lough itself. After that I was riding solo for a bit and using my particular advantage on the downhills (being 115kg does provide *some* help on descents). About 7k out of Leenane I started chatting with Barry, one of the many Integrity Solutions folks there, he had a borrowed hybrid with what seemed like stuck gear cables and was riding it single speed. Better him than me – the climbs weren’t crazy but it was nice to have a full range of gears. Luckily he was in pretty good shape, had a climbers physique even if he didn’t cycle much. We were a bit confused at no sign of a feed station at the Delphi Lodge, but we figured there would have been marshals directing us in if it had been there. Did spot a couple of bikes in there when we rolled past, but not enough to look like an official stop (I think it was changed shortly before the event). I stuck with Barry for a while having a chat, looking at the view of Killary Harbour, especially the 160k folks who were heading on to the west across the water from us. I left him when we hit the bigger downhill coming down the fjord and eventually came around the tip of it and rolled into Leenane for the food stop. I had arrived too late and missed the sandwiches, but they more than made up for it in buns, brack and bananas. Just before I left we had a sandwich delivery! I could only manage one 🙂 Thank you to all the volunteers there who fed & watered us! I took a good long break in Leenane, maybe 45 mins or so, worried about my legs feeling sore earlier, so wanted to give them a chance. 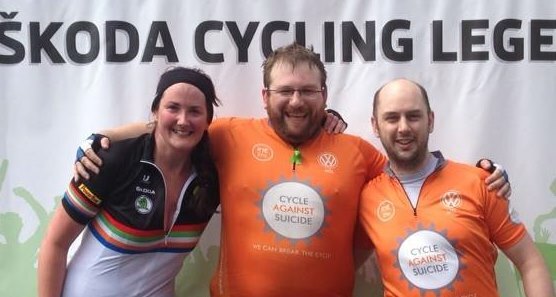 Good to chat with my fellow riders, and I met a few more bedecked in the orange Cycle Against Suicide jerseys, including Sorcha and Paul – who I later met for the photo above at the finish. I left the feed station almost last, maybe 5-10 riders behind me. Back on the road I was feeling really good, figured the earlier soreness was mostly due to the saddle height issue, so I started to push on and passed a few folks. Came across a few newbies who seemed to be struggling a little, so tried to help out a wee bit with moral support. Gave one lady an energy gel and some towing practice and had a chat for 3 or 4k. Pushed on up, and had a chat with a few more folks (including another orange jersey – Veronica). About 12-14k out I decided to finish up with a bit more speed and even averaged 40km/h on the flat for a kilometre or two, which is way above my regular cruising speed so well happy with that. Not sure what my clock was for the “80km” – which appeared to be more like ~85km – as afterwards I did the Greenway to Newport which was a nice warm down, finishing the day with 102km total in just under 6 hours (moving). I thought Westportif was very well organised & marshalled. That route is awesome, even jealousy inspiring for other clubs I’d say. A slightly longer distance would have been nice, say 100-115, but if that’s the biggest complaint I’m sure they can live with it. Thank you to all the organisers and volunteers of Westportif 2014 and the criterium, see you next year! And you! Looked like you were set for a good evening! Cool, will check it out, great views up there!